I had high hopes for a stunning sunrise visible from my tent on the headland but once again I was disappointed as the view below greeted me when I unzipped the flysheet. Another misty morning, and in fact it was to stay with me all day. Nevertheless I was looking forward to another great days walking. It had been a strange night! The ground I had pitched on that looked perfectly level yesterday in fact sloped making sleep difficult. Only the careful placing of various items out of my rucksack stopped me from sliding down the tent ;)! Eager to get out on the trail again, I had a quick breakfast and squeezed everything back into my tardis of a rucksack. Setting out along the headland heading south, I quickly reached the point and turned west – well it was either that or walk out into the sea ;)! The beautifully atmospheric scene below greeted me. At this point there are two choices, to walk across the headland or to drop down and walk another undercliff path although a much shorter one than yesterday. I chose the more interesting route and headed down the cliffside where the path wove through the contours of the collapsed cliff, passing gnarled trees growing out of rocks with seemingly no soil. 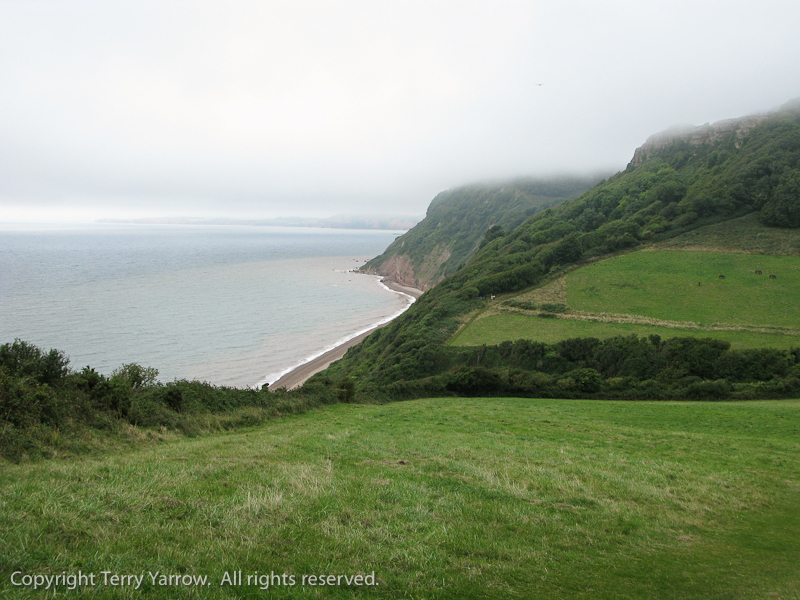 Eventually, having reached sea level, the path climbed up again and over the next headland before dropping down a gentle grassy slope into Branscombe Mouth. Despite the grey morning and lack of people, there was a cafe open by the beach and I was tempted to call in for breakfast, but I chose to continue walking. As I headed up the next climb though I looked back and wondered if I should have stopped ;)! 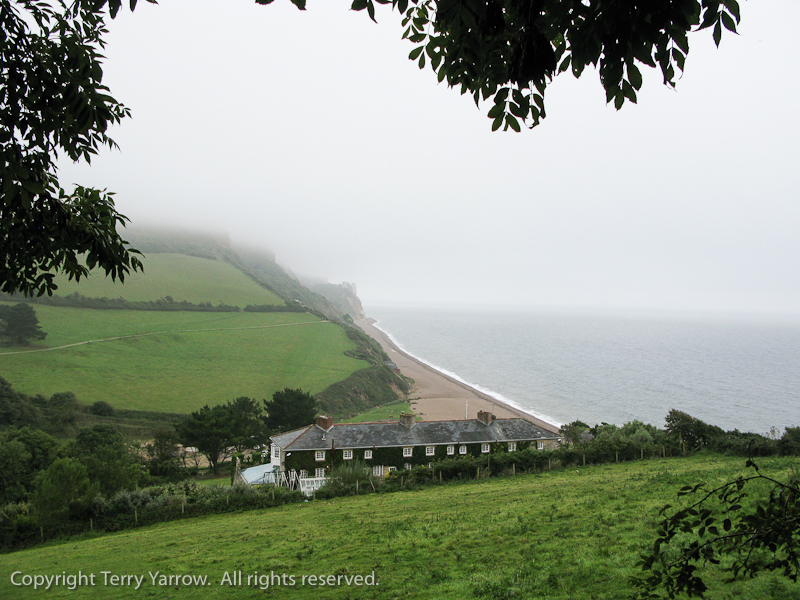 Once again I disappeared into the mist and once again dropped down into another bay, this time Weston Mouth. The walk down was similar to the last one, gentle and grassy but the climb up is somewhat different! Having reached beach level, a long and steep series of steps took me through the trees and shrubbery to reach the steep, grassy hillside above. Here I paused for elevenses beside Weston Plats, an area that could be described as 19th century clifftop allotments. 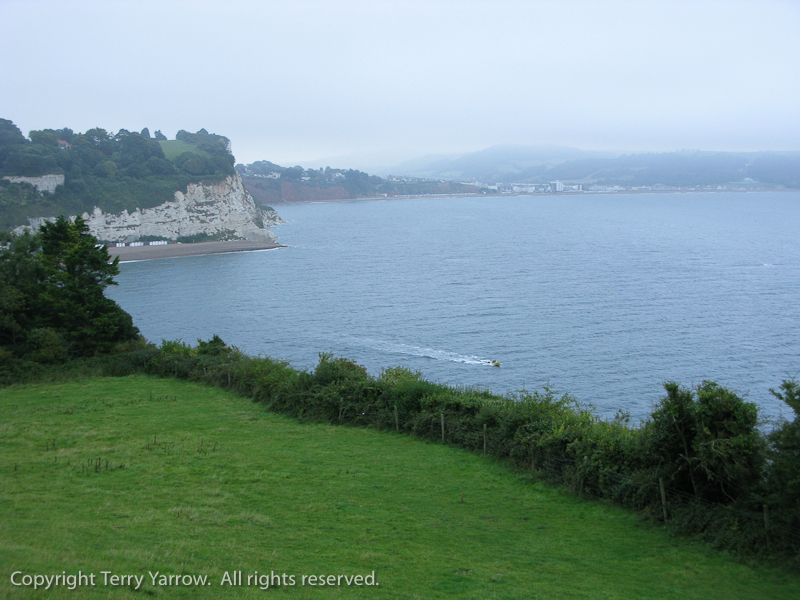 The micro climate was conducive to producing early flowers and vegetables, notably the Branscombe potato, and the position above the beach kept the village fishermen occupied whilst enabling them to keep an eye on the sea. The Plats are now owned by The National Trust. In the 1800’s the villagers used donkeys to transport their produce and as I struggled up the steep slope I wished I had one to transport me ;)! It was interesting walking over the flat, grassy headlands! 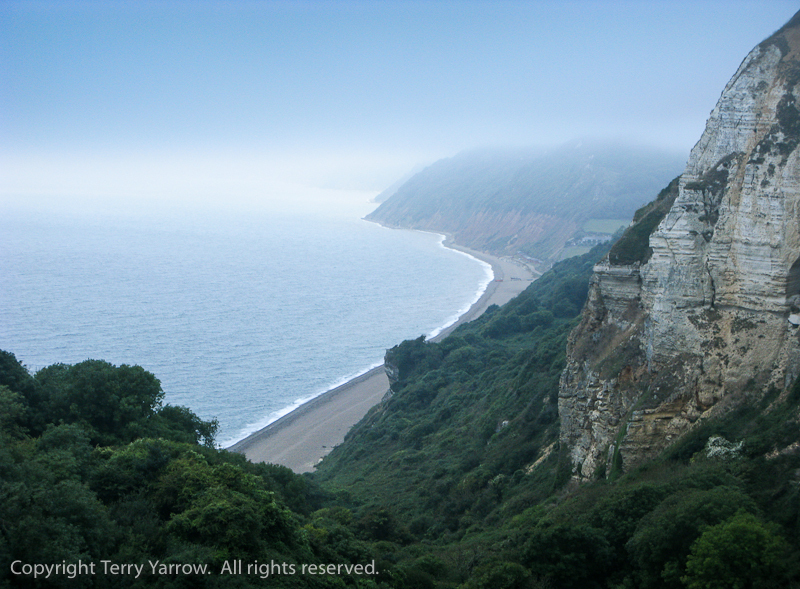 Usually route finding on the coast is fairly simple – just keep the sea on your left and the land on your right. However when you can see neither, that adage becomes somewhat inappropriate! 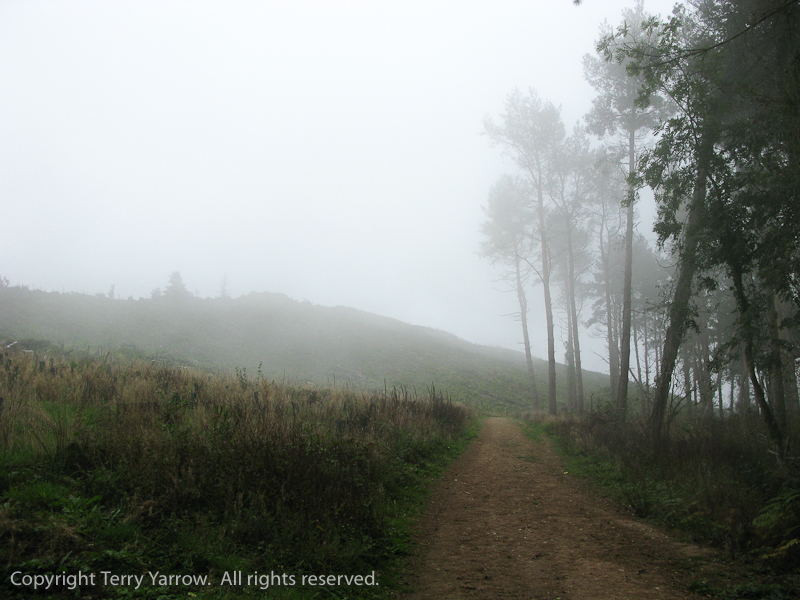 With dense mist and low cloud, visibility was minimal and for much of the time there were no clear paths to follow. Now I’m usually a map and compass sort of a guy but it is at times like these that I am grateful to the smart phone app designers and for the inbuilt GPS :)! 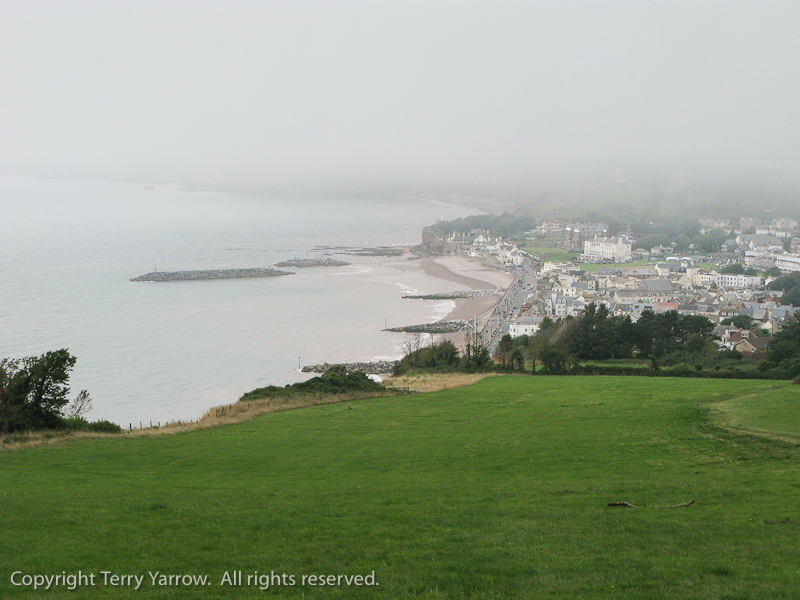 This kept me on track and ultimately I dropped down into Sidmouth, one of the larger seaside towns along this part of the coast. As I walked down another gentle grassy slope I could hear the sound of jazz music wafting up on the breeze and I looked forward to sitting and listening to it as I had some lunch. Annoyingly though when I reached the town all was silent! 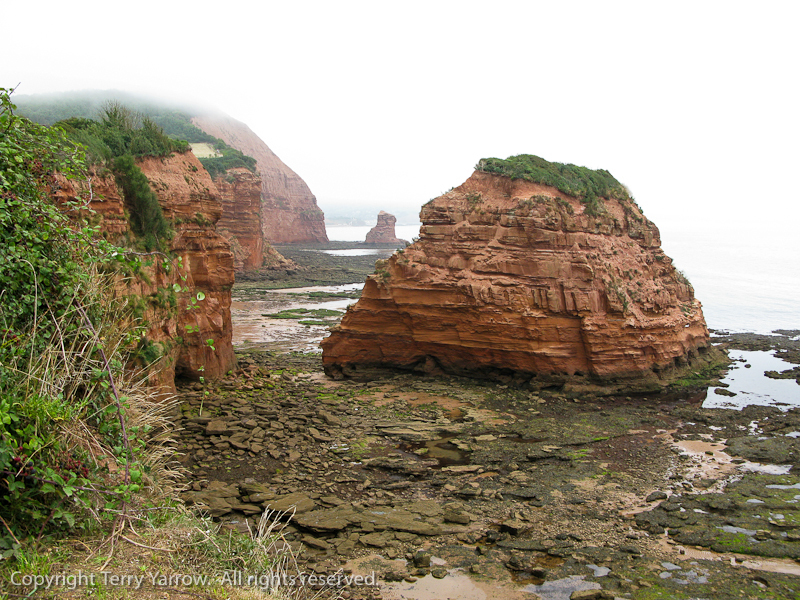 I mentioned in yesterday’s post that the red cliffs would become a feature of this walk and this was very evident as I reached the seafront and looked back. This red sandstone would stay with me for the rest of the walk. 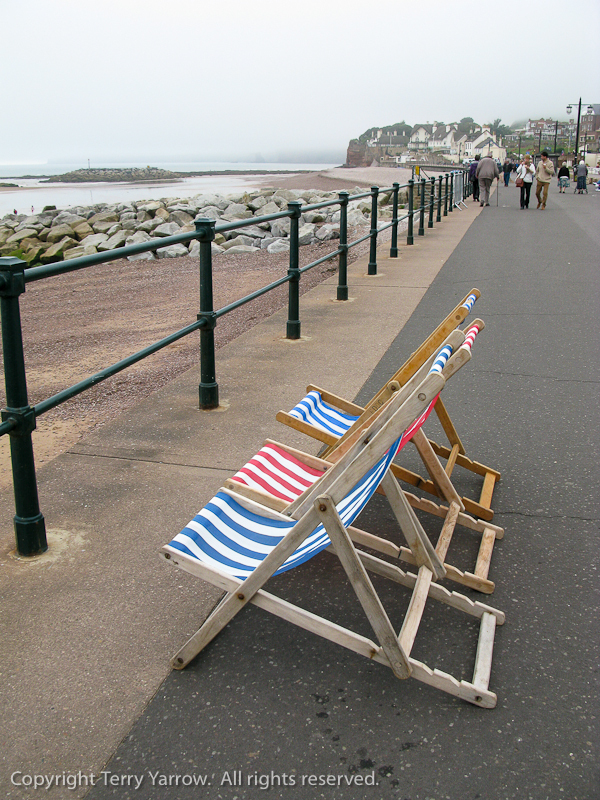 Sidmouth is a popular tourist spot even on a day such as this. Normally this would make me pass through quickly but I needed sustenance so I stopped for lunch before ambling along the sea front passing empty deck-chairs, a reminder of a summer now seemingly gone. Eventually I left the town, passing the well known Jacob’s Ladder, a promontory that was once a lime kiln, now converted to a cafe. Ahead of me was the last real up hill section of the walk. Climbing up along the Monks Path I crossed High Peak, once an Iron Age hill fort although part of it has long since collapsed into the sea. High Peak was a somewhat sad sight as the last time I walked there it was covered in a wonderful woodland. Now though the top is bare. I dropped down the other side into Ladrum Bay with its amazing red sandstone geological features. Many sea stacks stand proud along the shoreline which is rich in Triassic fossils, indeed it is one of the most important sites in the world for these remains. Ladrum Bay is also home to a large caravan site and as I passed through, there was one incident that made me chuckle out loud! Beside the cliff top I passed a man with a controller in his hand nonchalantly gazing out to sea. Just along the coast there was a radio controlled helicopter ducking and diving and doing all sorts of fast aerobatics and I was amazed that the man controlling it could do all that whilst not even looking at it…….until I realised he wasn’t! Far out at sea I could just make out a silent radio controlled glider – someone else was clearly operating the helicopter :)! The coastline along this part is more gently undulating that the switch back of previous days and it was a very enjoyable easy walk for my last afternoon. Despite the constant mist, there were still lovely atmospheric views in all directions. As usual the path became slightly busier along this stretch, a clear outcome of having a nearby caravan park. What I think is great though is how everyone says ‘hello’ as they pass, or stops to pass the time of day. I thought it would be good if this practice could be extended to our towns where people pass by anonymously. There was one particular young couple – we passed each other probably four times, each leapfrogging the other as we stopped at different times. We had met earlier in the day when they were struggling to find the route with their map and my smart phone app came to the rescue. We chatted several times along the way and they passed me once more along this stretch of the coast. I didn’t come across them again and it seemed almost sad – who were they and what were their stories? Our paths had crossed momentarily and probably never will do again. My route continued over Brandy Head, so named because of its connection with smuggling which was rife all along this coast. Kegs of Brandy were one of the main commodities and gave the headland its name. It is also known for the somewhat innocuous building in the picture below. 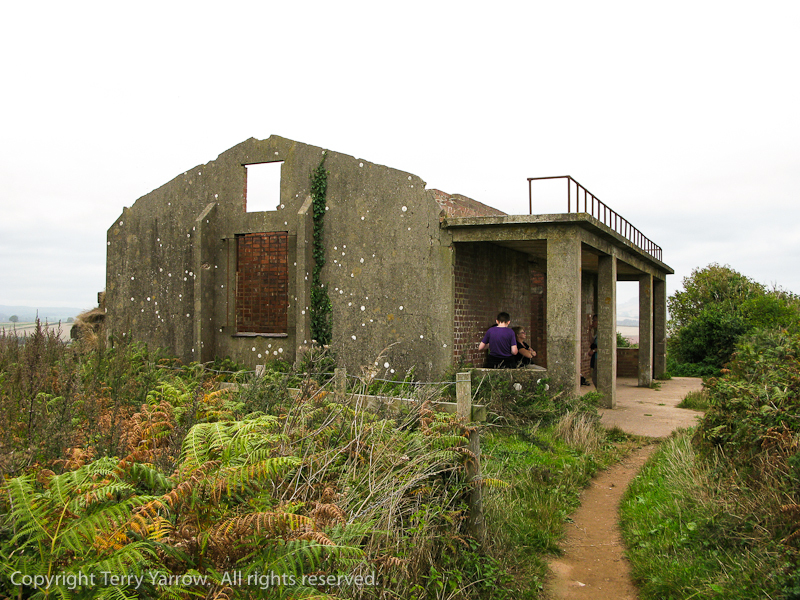 This was the observation hut used in World War II to test new aircraft mounted canon and gunsights. Local boys from Otterton used to sneak out on to Brandy Head and watch the aircraft whilst hiding in the shrubbery – somewhat dangerous but fun! Apparently divers would collect gun cases from the sea bed and sell them at Ladrum Bay. 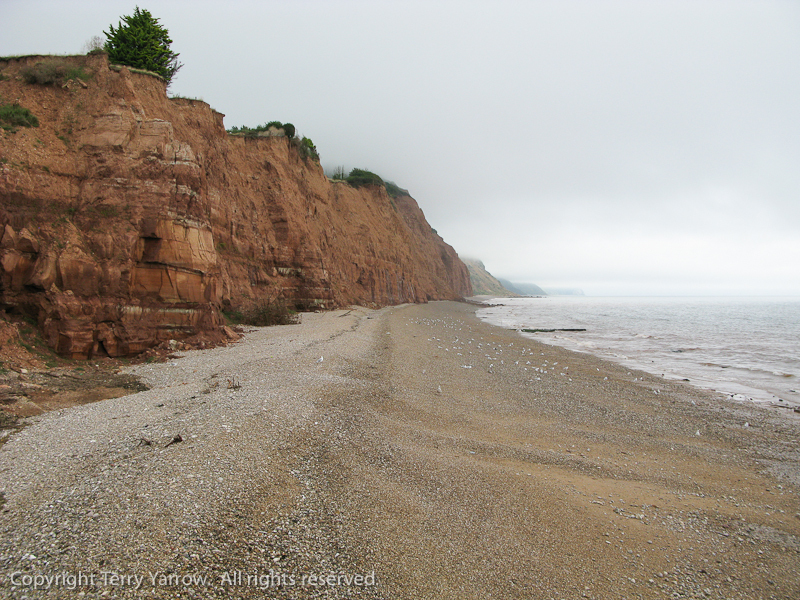 This headland has quite a history! 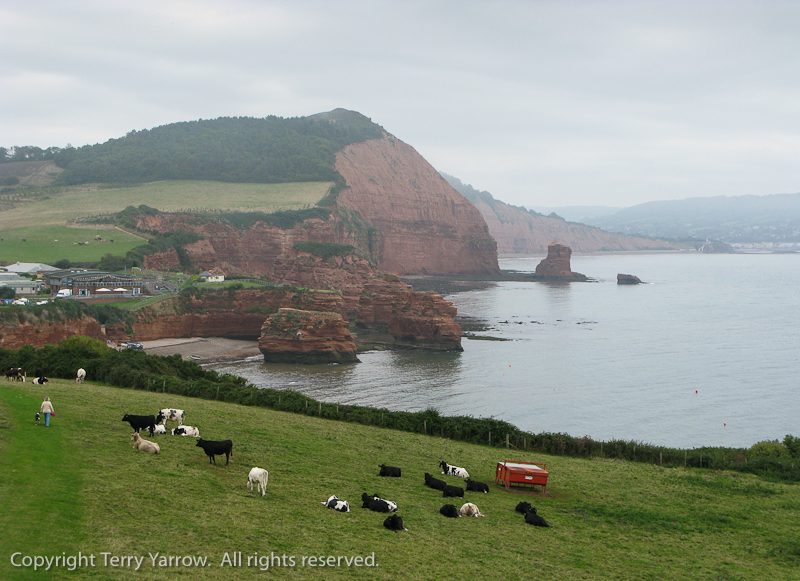 I was nearing the end of my walk now and before dropping off the headland I took at last look back the way I had come. 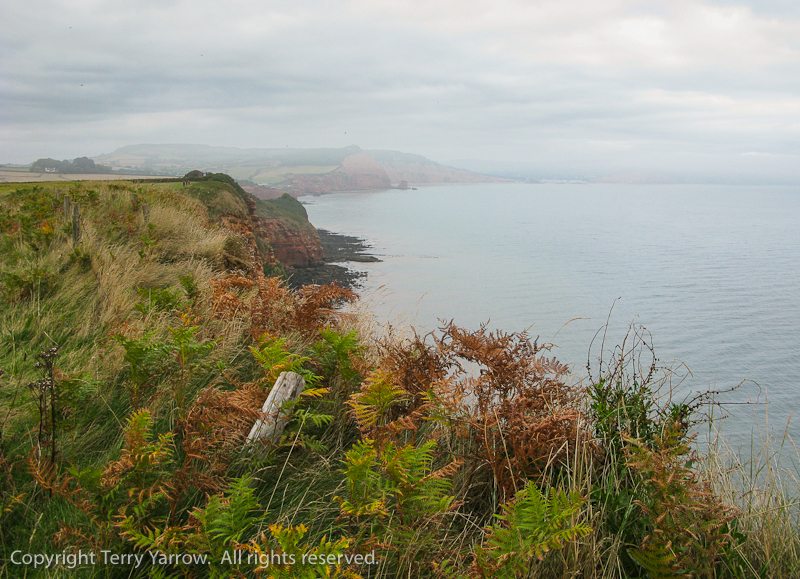 There was a distinctly autumnal feel in both the colours and the mist as the coast faded into the distance. 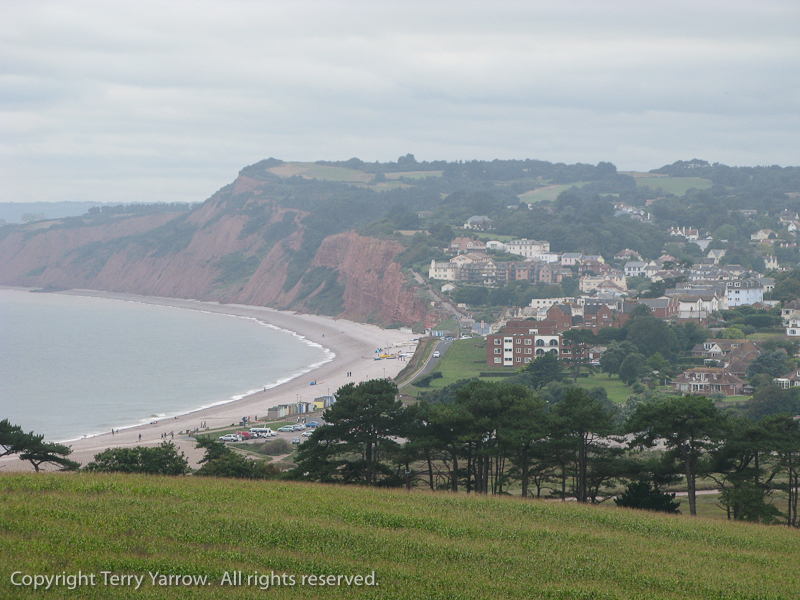 Turning to continue my journey, I had a first view of Budleigh Salterton, my finishing point. Not that the walking was over as this is yet another place that necessitated walking a mile or so inland to cross the River Otter and marshes before walking back out the other side to reach the town itself. 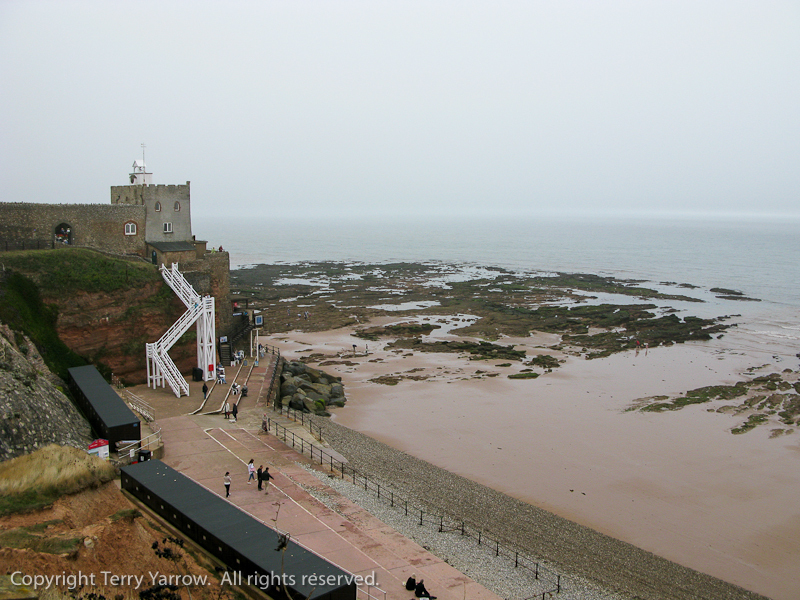 At 5.15pm, after walking just under 16 miles, I walked onto the sea front. It was a fitting place to end my four day ‘pilgrimage’ as one line of my ancestors came from there. 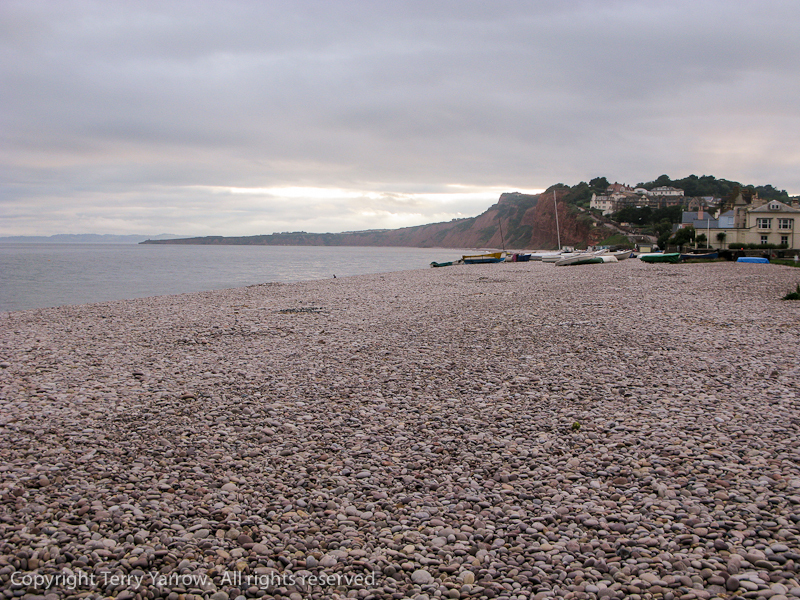 I therefore have Budleigh Salterton blood in my veins :)! What a fabulous four days! Sunshine, gale force winds, pouring rain, mist, low cloud, what a variety of conditions – it was impossible to get bored with the weather. I wish I had been able to take my DSLR so that I could have done more justice to some wonderful views that my little compact camera couldn’t handle but there literally wasn’t a square centimetre of space in my rucksack. Nevertheless, I hope the pictures have given you a flavour of a fantastic walk and that you have enjoyed walking with me. The Dorset Rambler (or should that be The Devon Rambler). If you would like to contact me, my details are on my website which is http://www.yarrowphotography.com – comments and feedback are welcomed. 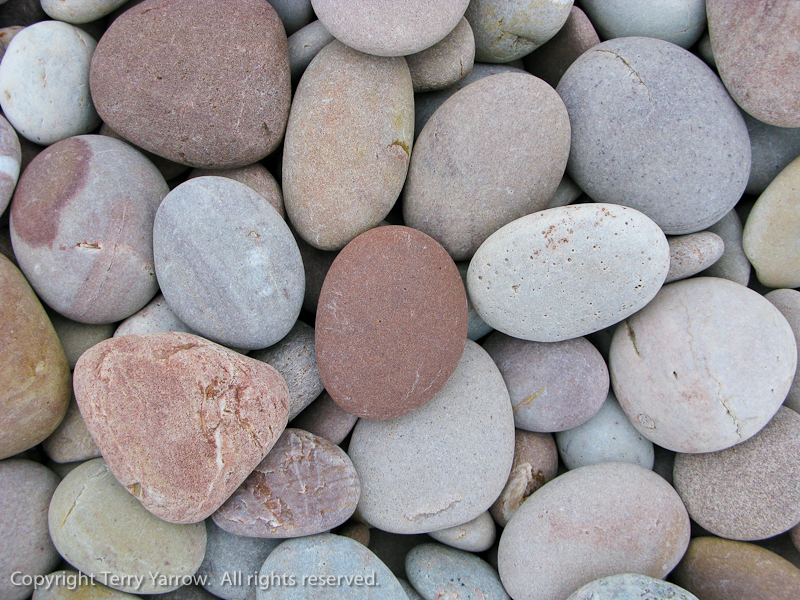 All photographs, poems and words in this blog are the copyright of The Dorset Rambler and must not be reproduced without permission. Next A walk on the wild side…..with the camera! Thanks Linda 🙂 It was my granny Yarrow who came from Budleigh. My four grandparents were my dad’s mum from Budleigh, my dad’s dad from Cambridge, my mum’s mum from London and my mum’s dad from Lytchett Matravers.